Last weekend was the IE Zine Fest and there was a Freeways Collide zine event at Space 15 Twenty yesterday–where did all these events come from? 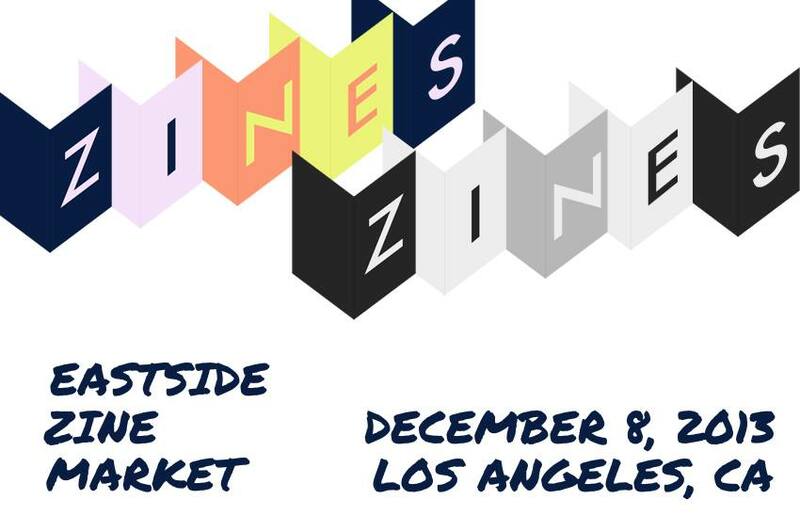 When LA Zine Fest started, it was hard to find events in the area that mentioned zines; now we have a wealth of them! It’s great to know that people are actively organizing and reaching out to create events that allow zinesters to meet each other and share their work. One such upcoming event that’s on our radar is Eastside Zine Market, organized by Denice and Adam of Seite Books. We asked them a few questions about why they got this event together and how it all came to be. LAZF: What made you want to organize the Eastside Zine Market? Seite: We were at a meeting with Jesus Reyes of East LA Rep along with a couple independent presses discussing an alternative press event. We talked about how it was important to try and bring something like this to the eastside of Los Angeles and when could we do it. Eventually with the scale of what we were discussing it became apparent that it would need to be next year most likely. So we were throwing out ideas for something else we could organize this year during the Fall or Winter. We were already discussing independent press and zines have become a larger part of our shop so I suggested a zine event and everything fell into place. Los Angeles doesn’t have a zine event in the winter and there haven’t been any large zine events on the eastside of Los Angeles. With the LA Zine Fest moving progressively west to Culver City we also realized there would be at least a 2 year gap without any large zine event nearby. Since that meeting several people have helped organize and it’s been pretty spread out, people are so receptive to the idea that they reach out to help with the various components or put us in contact with those who can. LAZF: What are you expecting to see on the day-of? Seite: A lot of great zines, all the effort and time people have put it in to producing these amazing physical manifestations of their thoughts and ideas. And hopefully a lot of people coming out to see what’s being made or coming to trade and talk about what they’re working on. LAZF: Will you be tabling? If yes, what will you have? If no, why not? Seite: Yes we will have a table. Some more recent arrivals we’ll have there include a bunch from Mickey Zacchilli, her RAV series plus her collaborative series with Michael DeForge and Patrick Kyle. We have Internet Comics from Maré Odomo and by December we’ll also hopefully have Set Sail for Rocks by Michael Olivo which is also from Sacred Prism. We’ll also have several titles from this series of zines called The Life and Times and Butch Dykes which profiles women like Audre Lorde and Chavela Vargas. We’re always trying to find interesting new zines. LAZF: What was the biggest surprise or greatest challenge about getting this event together? Seite: The opportunity to even begin was really out of left field, we were surprised when we were shown the space which is essentially a big white gymnasium and then it was so easy to picture filled with different people and their printed work milling around. The challenge would be getting the word out, but there’s so much great work and talented people that will be there I’m hopeful turn out will be good. Seite Books has contributed a zine recommendation to our site and also hosted one of our first workshops. They carry an excellently curated selection of zines from around the world. < San Diego-based Mobile Zine Library asking for donations!